Commenting from her home in South Ayrshire Susan Crosthwaite said: “Windfarm development in Scotland is clearly breaching The Environmental Liabilities Directive and the Water Frameworks Directive. 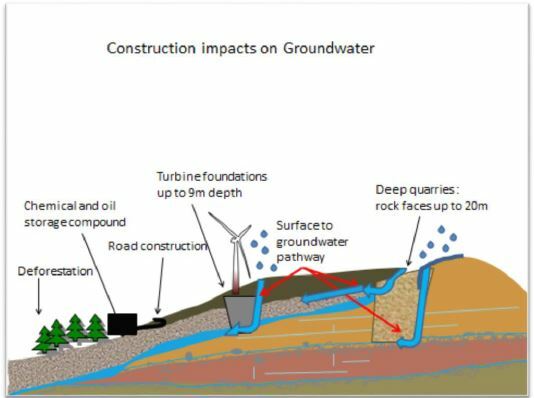 Developers and government bodies have allowed these developments to proceed in the full knowledge that there are risks to surface and groundwater. Authorities such as SEPA, Scottish Water, Councils and the Scottish Government have failed in their legal duty to protect the water environment. Public authorities should ensure the proper implementation and enforcement of the scheme provided for by this Directive. People wonder how windfarms can possibly contaminate our water. Firstly, most are constructed on areas of unspoilt moss, heather and deep peat, often with associated forestry. Construction vehicles churn up the ground to make access roads and clear the forests (approximately 3 million trees were cleared at Whitelee). Trees are pulled up, and the churned up peat is washed into the river systems by heavy rain, releasing excessive carbon which the water treatment works are not able to deal with. “The construction teams then blast quarries and ‘borrow-pits’ to provide rock foundations for access roads and turbine bases – six quarries with 85 articulated dump lorries ferried almost 6 million tons of excavated rock around the Whitelee site for roads and turbine foundations. These excavations allow access to the numerous faults (fractures) and dykes (intrusions) which crisscross Scotland and act as conduits for ground water. Chemical and diesel spills, therefore, have an immediate channel to the aquifer. Press and Journal 22/6/15 Noise data new weapon in war on windfarms How safe is your drinking water?